Many users run the risk of losing control of their computer due to attacks with bot programs. 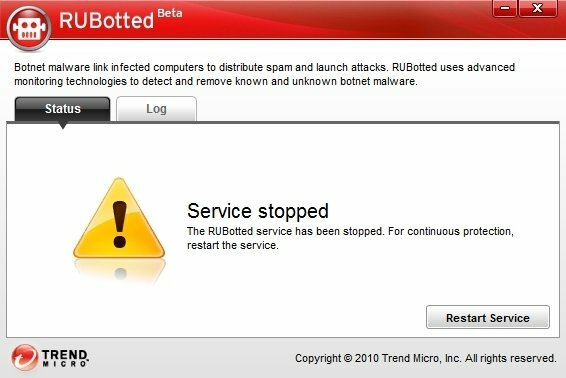 If you want to avoid infections with this sort of malware, the best thing you can do is entrust the security of your computer to a program like Trend Micro RUBotted. 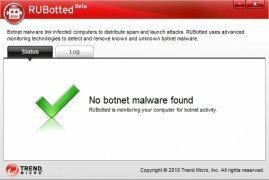 Trend Micro RUBotted has improved the detection of unknown bot clients, optimizing its capacity to clean and disinfect affected computers. Compatible with other security programs, it integrates perfectly into the computer's system without the user even noticing, unless infected. Then, by means of a pop-up window, it will proceed to remove the problem and will put the user in control of the console from which it will offer all the details of the cleaning process. Becoming part of a botnet can mean completely losing control of your computer. Detection and disinfection of bot malware. Detection activities in the background. Control console and complete information about the actions carried out. By downloading Trend Micro RUBotted any computer will be safe against the risk of becoming part of a botnet.